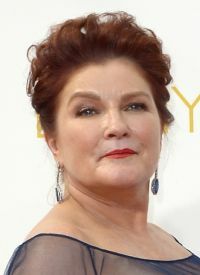 DUBUQUE, Iowa (CNS) — Kate Mulgrew discovered she had a talent for performance early in life when she read a poem to her class at Resurrection Elementary School in Dubuque. Her brother Sam, speaking recently at a book signing event at the Julien Hotel in late April in Dubuque, revealed to a crowd of several hundred fans that his sister recited a poem with such intense feeling, it made her teacher, a religious sister, cry. “She wasn’t the only Mulgrew to make the nuns at Resurrection cry,” Sam Mulgrew joked. His sister, probably best known for her television roles on “Star Trek: Voyager” and the Netflix series “Orange is the New Black” returned to her hometown as part of a tour for the new memoir she has written. In the book, “Born with Teeth,” Mulgrew details life growing up as one of eight children in an Irish Catholic family in a home on Langworthy Street. Mulgrew is one of the most famous graduates of Resurrection Elementary School and Wahlert Catholic High School. Although she no longer lives in Iowa, long ago taking her passion for acting to New York and beyond, Mulgrew still has some connections to Dubuque and the Catholic community there. Sam Mulgrew lives in the area and works as the business manager for the Trappist Monks’ casket making operation at New Melleray Abbey in Peosta. He also is active in the local arts community. He appeared at the book signing and interviewed his sister onstage. “I’m very proud of her for writing this book,” he said afterward. Perhaps the most powerful connection the actress has with the local Catholic community is with Mother Columba Guare, who in 1970 became the first abbess of the Our Lady of the Mississippi Trappist Abbey. She said at the recent book signing that Mother Columba was the most influential Dubuquer she has known. Mother Columba died in 2009, but some of the other nuns at the abbey remember her and the special relationship she had with Kate’s mother, an artist. Mother Columba was a lover of the arts and a poet herself. She enjoyed people and had a good sense of humor, Sister Gail said. The Mulgrews’ connection to the nuns was important after the death of one of the sisters in the family at a young age from cancer. The nuns later built a fountain on the abbey property in memory of Kate’s sister. It remains at the abbey today. The actress maintains relationships with her brother Sam and other family members in Iowa and around the country. The Mulgrew family also remembers their connection to the nuns fondly. Russo is the editor of The Witness, newspaper of Archdiocese of Dubuque.